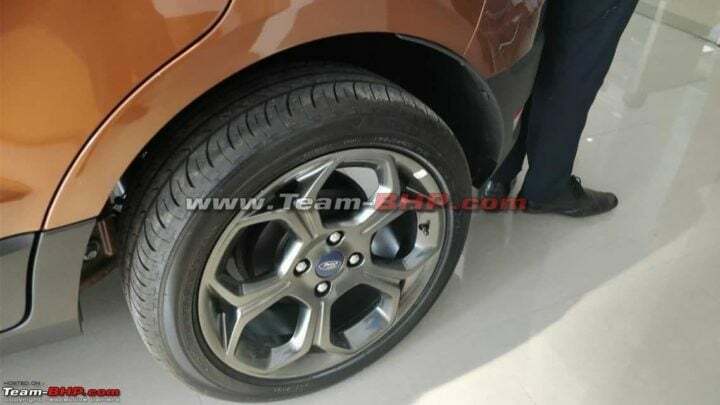 Ford Ecosport’s new top-end variant, Titanium S was recently spied. The reports show that the new variant gets a sunroof and some minor added features. There have been no announcements made by Ford, but the expected price is around Rs 12 Lakh. With that price, it comes into a competition with Hyundai Creta. Ford Ecosport Titanium S variant was last spotted in October 2017 during its test drives. However, recently at a dealership in Kerala, the new variant was spotted. 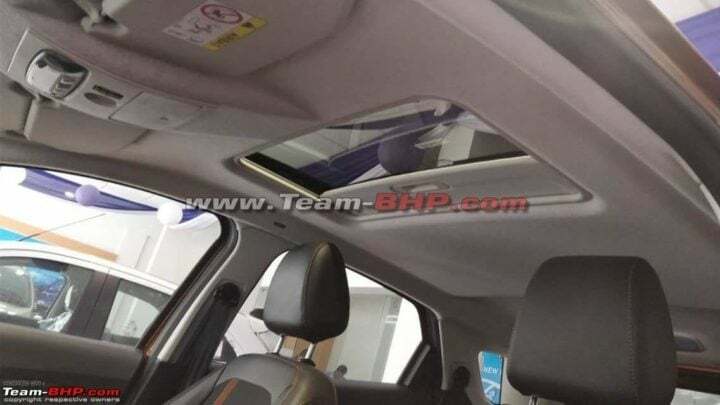 The key feature added is a new sunroof which is available only in this version. 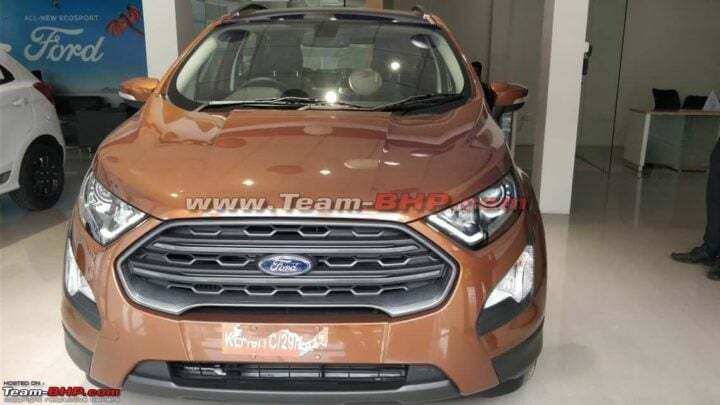 No official announcement is made by Ford yet, but it is expected to be around Rs 12 Lakh (ex-showroom). The current top-end variant is Titanium +, which is priced at Rs 11.35 Lakh (ex-showroom). If the Titanium S is priced so high, it falls in the same segment competing with Hyundai Creta. The Ford Ecosport Titanium S gets a new sunroof with 6-speed manual gearbox as key updates. It also gets all-black dashboard along with orange highlights around the centre console and on the door trim. The upholstery matches the black and orange theme. The new instrument console features chrome rings around the speedometer and tachometer. The centre console houses a floating touchscreen infotainment system. It also has a 3-spoke multi-functional steering wheel and a twin-pod instrument cluster with a large MID in the centre. Also, one of the images shows that the gear knobs has 6 gear markings. On the exteriors, Titanium S variant gets smoked headlamps with LED DRL, dark grey finish front grille and dual-tone front bumper with fog lamps. The car gets a blacked-out roof, a rear spoiler and roof rails. Also, the Titanium S variant gets 5-spoke alloy wheels with a grey finishing touch. As there have been no official announcements, the powertrains and engines specifications are not know yet. 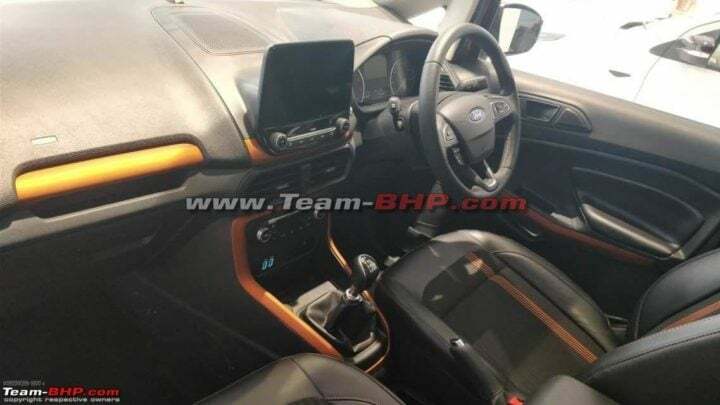 However, Ford might offer it with 1.5 Litre 3-cylinder Petrol engine and 1.5 Litre 4-cylinder Diesel engine options. The expected pricing has taken Ecosport up to a new price segment. Hyundai Creta’s top-end petrol variant is also priced at 12 Lakh, which is a bigger car. Thus with this price, it is due to receive heavy competition from the Creta Facelift. As of now, Creta offers a little more features in its top-end petrol variant than the Ford Ecosport Titanium S.